In production for Audible/ACX. Franklin Loves Lucy by Mary Matthews. 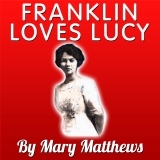 Lee Ann is currently recording a historical romance in the form of a memoir called Franklin Loves Lucy, written by Mary Matthews. This story chronicles the love affair between Lucy Mercer and President Franklin D. Roosevelt and is told from the perspective of Miss Mercer, social secretary to Eleanor Roosevelt. This title should be available for sale on Audible in October. The publication date will be posted here! Posted by lahowlett on September 18, 2013 in Uncategorized and tagged audiobook, Franklin D. Roosevelt, historical romance, Lucy Mercer, Lucy Page Mercer Rutherfurd.